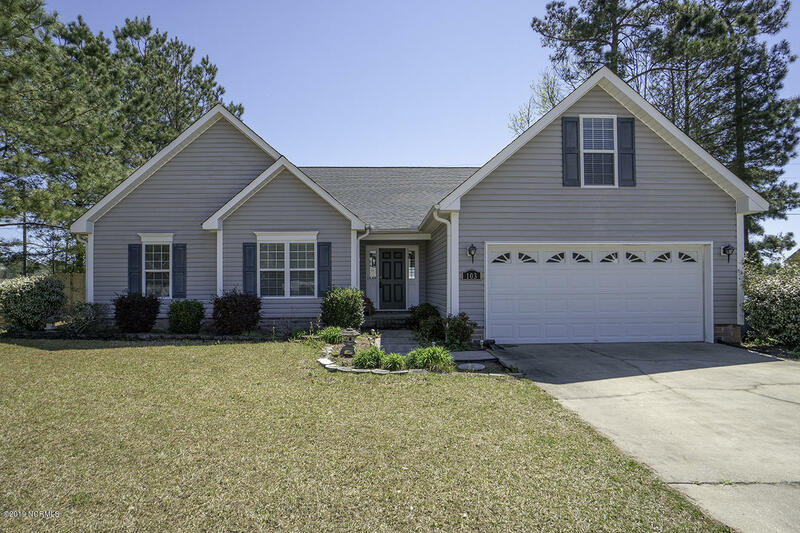 Located minutes from MCAS Cherry Point, this wonderful home features a new roof and new carpet! Step through the front door and immediately admire the high ceilings and bright & open floor plan. Spacious living room and family room provides plenty of room to entertain guests. Great kitchen boasts stainless steel appliances, granite counters, ample cabinet space, nice pantry, and is open to the relaxing sunroom. Head over to the HUGE master suite with a walk in closet, jetted tub, walk in shower and dual vanity w/ granite counters. Nice size guest rooms allow room for friends, and the bonus room could be used as an additional bedroom. Cozy up to the fire place on those cooler nights or enjoy the sunshine from the large deck overlooking the fenced-in backyard with 2 patios and storage shed!